We are sure that many people will find the question posed as the title of this chapter a little strange. Surely, evolution is about the origin and development of life-forms on earth—what has this got to do with religion? Evolution is science, isn’t it? And we are told that it has got to be separate from religious belief—at least in the classroom! Well, let’s see if evolution fits the bill as a true science as opposed to a religious belief. In order to do so, we must define some terms. Creationists are often accused of being unscientific or pseudoscientific, while at the same time those who promote evolution assume the mantle of “real scientist.” But what is science anyway? According to The American Heritage Dictionary, science is “the observation, identification, description, experimental investigation, and theoretical explanation of phenomena.”1 Or put more simply, science involves observing things in the real world and trying to explain how they work. The key word here is observation. You see, creationists do, indeed, believe in real “observational science,” sometimes called “operational science.” We enjoy the benefits of observational science every day. Whether flying in an airplane, having our illness cured by the wonders of modern medicine, or writing this book on a space-age laptop computer, we are benefiting from the technology that applies genuine observational science to real-world needs. These triumphs of science exist in the present and can therefore be the subjects of examination and investigation. Another type of science is known as “historical science,” sometimes called “origins science.” Historical science is the process of using the methods of science in the present to determine what happened in the past. Since the physical world exists in the present, all the evidence a scientist has available to examine the physical world also exists in the present. The scientist has no method to examine directly the past; thus, he must make assumptions in order to come to conclusions. However, assumptions are unproven, and generally unprovable, beliefs. Assumptions are no more than untestable guesses. Things that happened in the past are just that, past. They cannot be observed or tested in the present. They cannot be repeated or verified in the present. Then, you ask, how do we know so much about the past? Perhaps an example here would help illustrate this issue. 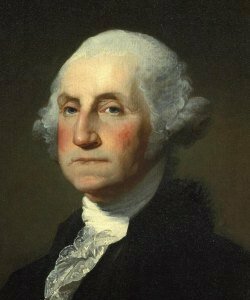 If you were to ask a roomful of people, “Do you think George Washington was a real person?” what would you expect the response to be? Of course, everyone would say that he or she believed George Washington actually existed. Now ask this question: “Can you give me a way to prove his existence scientifically, that is, by some experimental procedure?” The usual responses are “Test his DNA,” or “Dig up his bones.” But actually, these methods won’t work. First of all, DNA testing would only work if you already had a valid sample of his DNA to use as a comparison. If you dug up his bones, you still could not prove they were his. In order to make any conclusions, you would have to make some assumptions based on things you could not actually test. Molecules-to-man evolution is based on the premise that, through mutation and natural selection, organisms have, over the past three billion or so years, become more complex. These organisms have then progressed into an ever-increasing array of creatures until, ultimately, humans arrived on the scene. When asked if anyone has ever seen one type of creature change into another, the answer is always no. Confronted with this, the evolutionists will usually counter that it happens too slowly to be seen. The claim is that it takes millions of years for these painfully slow processes to occur. Well then, if the process is too slow to be seen, how do we know it happened at all? After all, no one was there to observe all these organisms slowly changing into more complex forms. Also, there is no way in the present to test or repeat what happened in the past. Any conclusions about things that are not testable in the present must be based on unprovable assumptions about the untestable past. Evolutionary biology, in contrast with physics and chemistry, is an historical science—the evolutionist attempts to explain events and processes that have already taken place. Laws and experiments are inappropriate techniques for the explication of such events and processes. Instead one constructs a historical narrative, consisting of a tentative reconstruction of the particular scenario that led to the events one is trying to explain2 (emphasis added). He then amazingly concluded, “No educated person any longer questions the validity of the so-called theory of evolution, which we know now to be a simple fact”2 (emphasis added). What is so obvious in our world that Mayr could call goo-to-you evolution “a simple fact,” which according to him no educated person would question? There are many supposed evidences for evolution. We will now consider two of these supposed evidences here and will examine them in the light of observational, rather than historical, science. Evolutionists often claim that the theory of evolution has nothing to do with the origin of life. They argue that evolution only deals with issues of the changes in organisms over time. They contend that life has progressed through purely naturalistic means, without any supernatural intervention. However, if they argue that life progresses by purely naturalistic mechanisms, then they must also delineate a natural process by which life came into being. 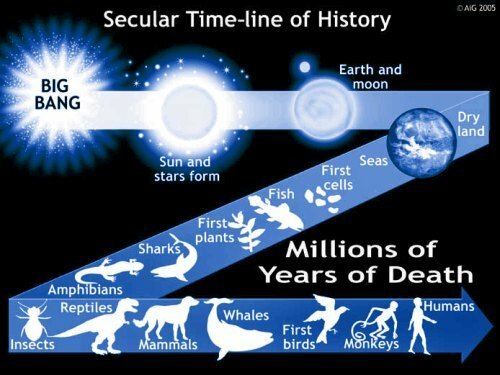 One supposed evidence for evolution is that life began spontaneously in the earth’s vast oceans approximately three billion years ago.3 Textbooks, magazines, and television documentaries constantly bombard us with this so-called fact. Just what is the evidence for the evolution of life from nonliving molecules? There isn’t any! There is no method to determine what the earth’s “ancient atmosphere” was like or the composition of the oceans at that time.4 No one was there to test or examine that environment. No one can say with certainty what the chemical makeup of the primordial oceans was. So how can it be claimed that simple proteins and nucleic acids arose spontaneously? One of the primary evidences used to support the theory of evolution is the fossil record. Evolutionists have long proposed that the fossilized remains of dead organisms, both plant and animal, found in the rock layers prove that life has evolved on the earth over millions of years. Using observational science, how can this conclusion be reached? There are only the fossils themselves to examine. These fossils only exist in the present. There is no method to determine directly what happened to these creatures; neither to determine how they died, nor how they were buried in the sediment, nor how long it took for them to fossilize. Although it is possible to make up a story to explain the fossil record, this contrived story does not meet the criteria for true scientific investigation. A story about the past cannot be scientifically tested in the present. The creationist looking at the fossil record reaches a far different conclusion from the evolutionist. To the creationist, the fossils in the rocks represent the result of a global cataclysm with massive sedimentation rapidly burying millions upon millions of creatures. This catastrophic event would account not only for the fossil record but also for the rock layers themselves. (Deposition of sediment in layers would have resulted from sorting in the turbulent Flood and post-Flood waters.) So which viewpoint is correct? Neither the creationist’s nor the evolutionist’s explanation can be tested in the present. But in this regard the creationist does have evidence. Evidence is found in a book called the Bible. The Bible claims to be the Word of God. It is a record of what God did and when He did it. In the Bible we learn how life began—God created it. The Bible helps us understand the fossil record—much of it is the result of a worldwide Flood as described in Genesis 6–8 . Like the historical documents that establish George Washington existed, we have a reliable historical document called the Bible to give us answers about our origin and about our world. An evolutionist has no historical documentation for his viewpoint. He relies on the assumptions of historical science for support. Herein lies a fundamental misunderstanding of the purpose and potential of science. Scientific inquiry properly involves the investigation of processes that are observable, testable, and repeatable. The origin and development of life on earth cannot be observed, tested, or repeated because it happened in the past. So is evolution observable science? No, evolution falls under the realm of historical science; it is a belief system about the past. How can an evolutionist believe these things without rigorous scientific proof? The answer is that he wants to. Evolutionists are quite sincere in their beliefs, but ultimately these beliefs are based on their view that the world originated by itself through totally naturalistic processes. There is a term for this type of belief system—that term is religion. Religion is “a cause, a principle, or an activity pursued with zeal or conscientious devotion.”6 It should be pointed out that religion does not necessarily involve the concept of God. 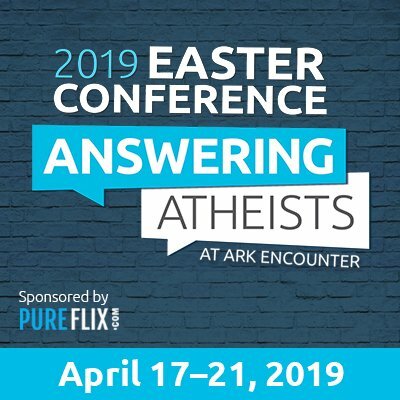 Perhaps a few observations from some of the world’s leading evolutionists will now put the question posed in the title of this chapter into perspective. It is obvious that these two influential biologists believe that evolution is a religion—a religion of atheism where there are no end products and where evolution reigns supreme. Writing a superb article about the rise of the Darwinian fundamentalism in The Spectator, the journalist Paul Johnson sums up the belief system of atheistic evolutionists with great insightfulness. Although Paul Johnson uses the word nature, he actually is referring to evolution. By this he means chance random processes honed by natural selection over eons of time. 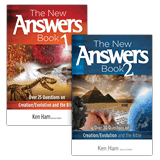 This is the process by which everything has been created, according to the evolutionists. The everything can be an inanimate object like a range of mountains, or it can be incredibly complex creatures like you and the authors of this book. A holy book—Christianity teaches that the Bible is the Word of God and that this book teaches us what to believe concerning God and what God requires of us. The holy book of the evolutionists is Darwin’s Origin of Species. 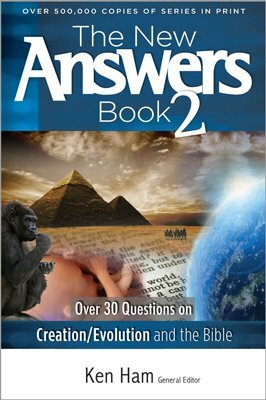 The evolutionists believe that this book gives an explanation for the origin and development of life on earth11 without the need of any God or supernatural agent. The origin of everything—Christianity teaches that in the beginning God created everything (that is, the entire universe with all its stars and planets, all plant life and all animal and human life) out of nothing over a period of six literal days. In comparison, evolution teaches that in the beginning nothing exploded and gradually evolved over billions of years into the universe that we see today. The origin of death and suffering—Christianity teaches that when God created everything, it was perfect. As a result of the sin of the first man, Adam, death, disease, and suffering entered the scene. Evolution does not recognize the word sin but teaches that fish-to-philosopher evolution can only proceed via death. Hence, death, disease, and suffering are the necessary driving forces of evolution; from this concept, we get the phrase survival of the fittest. The reason why humans are here—Christianity teaches that humans are the pinnacle of God’s creation and that they were made in God’s image and likeness. In contrast, amoeba-to-architect evolution teaches that humans have evolved from some apelike ancestor, which in turn evolved from another sort of animal. The future of humans—Christianity teaches that one day the Lord Jesus Christ will return to this earth and that He will create a new heavens and earth where those people who trusted Him as their Lord and Savior in this life will live with God forever. Evolution, on the other hand, teaches that humans are not the end product of evolution; evolution will continue and humans will either become extinct or evolve into some other species of creature that will definitely not be human. The future of the universe—Christianity teaches that the present universe will be burned up by God, and He will then create a new heavens and earth. Evolution, on the other hand, teaches that one day the universe will reach what is called a heat death, although it is in effect a cold death, for the temperature of the universe will be just a fraction of a degree above absolute zero. This will happen when all the energy that is available to do work will have been used up, and then nothing will happen—the universe will just “be.” The time period for the universe to reach this state is almost unimaginable. It is thought that it will take about a thousand billion years for all the stars to use up all their fuel and fizzle out. By then, of course, there will be no life in the universe; every single life-form, including humans, will have become extinct billions of years previously. There will still be, however, occasional flashes of starlight in the dark universe as very large stars collapse in on themselves to form black holes. For the next 10122 (that is the figure 1 followed by 122 zeros!) years, this so-called Hawking radiation will be the only thing happening in the universe. Then, when all the black holes have evaporated, there will be darkness for 1026 years, during which time the universe will simply “be” and nothing will happen. Evolution therefore leads to the teaching that you can do as you please. You can live your life just to please yourself. Many people today live such a life. They have abandoned the faith of their forefathers and have embraced the doctrines of evolution with its atheism. No wonder we are living in a “me, me, me,” hedonistic society where everything that you do is to try to please and bring pleasure to yourself. This is more than “selfish ambition”; it is totally decadent and is in total contrast to what Christianity teaches about what our ambition should be—our chief end is to glorify God (not ourself) and to enjoy Him (not ourself) forever. Previous Chapter Information: Evidence for a Creator? Next Chapter Is the Bible Enough? Ernst Mayr, “Darwin’s Influence on Modern Thought,” Scientific American, July 2000, p. 80, 83. For the sake of this discussion, we will not consider the proposal made by some who claim that primitive life was brought to earth by aliens in the distant past. The authors accept the biblical view of history, not the millions-of-years view. They do not accept the evolutionary time scale; this is presented here merely for the sake of this discussion. Leslie E. Orgel, “The Origin of Life on Earth,” Scientific American, October 1994, p. 78. Michael Ruse, “Saving Darwinism from the Darwinians,” National Post, May 13, 2000, p. B-3. William B Provine, Origins Research 16, no. 1 (1994): 9. Paul Johnson, “Where the Darwinian Fundamentalists Are Leading Us,” The Spectator, April 23, 2005, p. 32. Laura Sheahen and Dr. Richard Dawkins, “The Problem with God: Interview with Richard Dawkins,” www.beliefnet.com/story/178/story_17889.html. I (MW) once knew a professor of biology who told me that he believed that Darwin’s writings were inspired and that he read from the Origin of Species for at least 20 minutes every night before retiring to bed! Jeremy Rifkin, Algeny (New York: Viking Press, 1983), p. 244.